The kitchen is the heart of any home. A lively kitchen is what brings the family together. I would not be wrong if I say that your kitchen is one of the busiest spaces in your house, all day long. Noise of the utensils, a sweet mix of aroma of a freshly baked pudding or boiling curry, children running around and people happily sipping a cup of hot tea around the table are such common sights in our kitchens. Planning interiors for such a vibrant and busy space needs some smart solutions. The flooring must be rugged and long lasting as the usage will be far more than any part of the house. 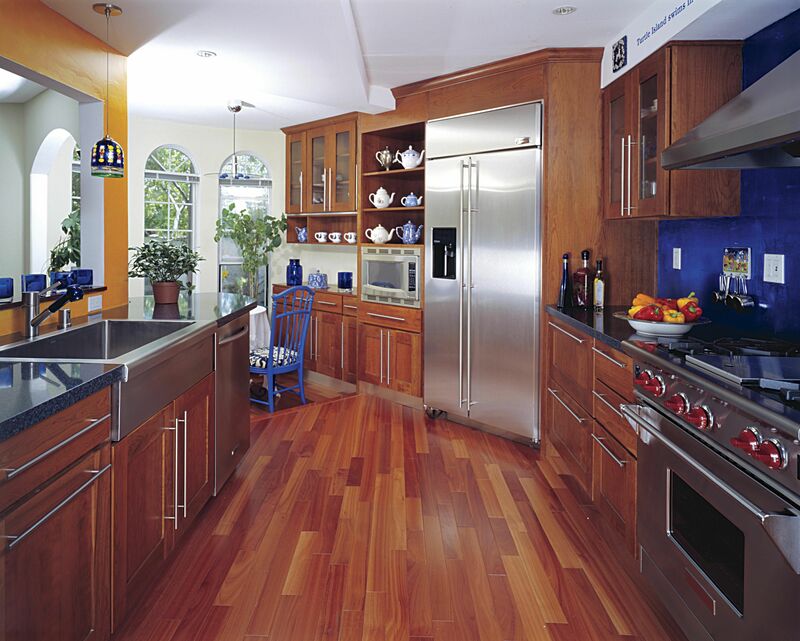 Hardwood flooring is a great option for your kitchen if you are looking for rustic yet classy feel to your space. Using wood in a semi-moist space like kitchen may seem to be a farfetched idea for some of you. But here I would like to elaborate on the positives of installing high quality flooring solutions from top Wooden Flooring Dealers in Delhi NCR and a word of advice of how to make it last longer. So, let’s begin. For someone who wants to make a style statement with their home interiors, wooden flooring is a perfect choice. It is a versatile model which can be used to give various finishes to your kitchen. Right from a contemporary minimalistic look to a regal look to a rustic farmhouse look, hardwood can be your choicest material. Wood is one of the most durable materials you can use for flooring. Be it engineered wood or hardwood, these planks are designed to last for decades together. Having said that, homeowners stay away from installing wooden flooring for kitchen as water may damage the material. The fact is, when a liquid spill is quickly cleaned and dried, wood stays unharmed. You can select a wooden flooring with additional lamination or finish that prevents moisture penetration. Unattended leachable is what cause the damage. Your kitchen floor need not hurt! You can have the softest and warmest kitchen floor by using the best options offered by the leading Wooden Flooring Dealers in Delhi NCR. The flooring is so comfortable that your little one can play on it, your puppy can roll around or you might just sit down and browse through your Instagram feed while the dish is cooking. This comfort can never be delivered by ceramic tiles. Wooden flooring is a great way to make your kitchen environment friendly. The natural colour, texture and grading of the wooden panels make you feel closer to nature. Other man-made flooring options contain chemicals, radiation, emit toxins and basically make your personal space unsafe. Wood on the other hand absorbs heat and gives a soothing feel to your kitchen. Compared to ceramic tiles, installing wooden flooring might be a little expensive. Depending on the material you select, the finish and the complexity of installation, the cost may vary. Having said that, wooden flooring for your kitchen is a good investment as it can serve its purpose for a long time. It makes the space look classy, tidy and appealing. When taken care of, wood can grace your kitchen floor till you get bored of it. The planks can later be reused in some other space or the Wooden Flooring Dealers in Delhi NCR refurbish them for further use. Opt for good quality hardwood that has good moisture resistant finish. Regular sanding and refinishing are highly recommended. Do not allow any kind of liquid to stay on the floor for long. A big NO to wet mop or steam mopping. You can just learn more about hardwood flooring maintenance via online search. Wooden flooring has the touch and feel that no other material can deliver and that is what makes homeowners love it. When taken care of, the lifespan of wooden flooring can be over a century. So, if you are planning to make your kitchen a family space, why not make it more homey by getting cosy wooden flooring!